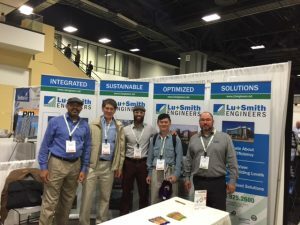 Lu+Smith ENGINEERS participated at the GREENBUILD EXPO in Washington, DC November 18 and 19, 2015. This is the premier international conference and expo for the green building industry, bringing together experts and frontline professionals dedicated to sustainable building. Our MEP engineers look forward to many conversations with show attendees and other exhibitors. Please stop by and talk with us about the latest industry trends, and energy modeling and commissioning in particular. You can learn more about the GREENBUILD EXPO, here.